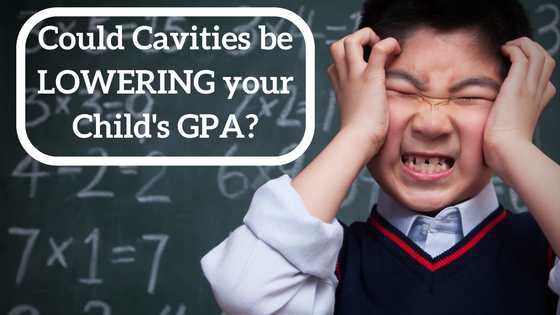 Could cavities be lowering your child’s GPA? Most parents know that they should be encouraging their kids to brush and floss daily and that they should take their kids to the dentist twice a year. However, many parents don’t know that there is an association between good oral health and better school performance. Tooth decay is largely preventable, yet it remains the most common chronic disease seen in children. It is 5x more prevalent than asthma. In fact, the CDC reports that 42% of children ages 2 to 11 have at least one cavity in a baby tooth and that 21% of kids 6 to 11 have a cavity in a permanent tooth. Cavities can be painful and can potentially cause early tooth loss. Kids with poor oral health are 3x more likely to miss school than kids with healthy mouths. These children tend to have poor school performance due to multiple school absences. Studies have also found a decrease in focus/attention span in kids with cavities as a result of dental pain. Improving a child’s oral health status may be a means to enhance their educational experience. Unfortunately, tooth decay can have an even larger effect on the well-being of a child than school performance. Dental pain and tooth loss can result in difficulty with speech and eating. It is also linked to teasing and poor self-esteem. Dental caries is the disease process that causes tooth decay or cavitations (holes) to form on the teeth. It is caused by bacteria and is a chronic disease. Cavities are simply a symptom of the greater disease. The good news is that the disease can be prevented or controlled with good oral hygiene, regular dental visits, application of fluoride and diet control to reduce sugar and acid exposure in the mouth. Oral hygiene is an important factor in keeping our children happy, healthy and thriving. Give your kids a head start on a great school year by making oral health a priority in your house. Are you suffering from bad breath? Which home whitening product is right for me? Contact us today for hours or to schedule your next appointment.